An unsettling topic for some and a downright pariah for others – the combined form of geography and politics when associated with production and distribution of oil and gas leaves little room in the polarized debate over which country deserves to have their share of the world’s oil and gas reserves. Around the onset of the Second World War, the US supplied about 63 per cent of the world’s oil, with a barrel of oil costing about a dollar (roughly $17 in 2014 dollars). Many decades later, an important shift took place when the US reached its peak oil production in 1970; as the output was squeezed, oil shifted from a suppliers’ market to a demand market. That is why the Organization of the Petroleum Exporting Countries (OPEC) oil embargo in conjunction with the Yom Kippur war in 1973 was such a game changer. In the weeks before the Arab-Israeli conflict, oil was just $2.90 a barrel (in the same range as the pre-second world war price in today’s dollars). During that war, the oil producers’ cartel began flexing its economic muscles causing the price of oil to quadruple by the end of the year, it would never again return to pre-1973 levels. A new dynamic emerged: energy exporters discovered their influence in global markets, the global balance of power in energy shifted and importing countries found themselves vulnerable as never before. In a study directed by Harvard University’s Geopolitics of Energy Project at the Kennedy School, the Center for Energy Studies at Rice University’s James A. Baker III Institute for Public Policy, and the University of California, Davis Graduate School of Management, it was concluded that some of the most dramatic energy developments of recent years have been in the realm of natural gas. Large quantities of North American unconventional gas are now commercially viable, changing the strategic picture for the continent and raising the possibility that the United States could become an exporter of natural gas to Asian and European markets. The modeling approach to global gas markets used in this project highlights the importance of economics and geology in determining the future of natural gas, but, importantly, the study pays particular heed to the geopolitical dimensions of natural gas. Assess how these changes in the global gas market will influence global politics. It’s a fact worth keeping in mind that many of the world’s leading oil producing countries are either politically unstable or at serious odds with the United States. 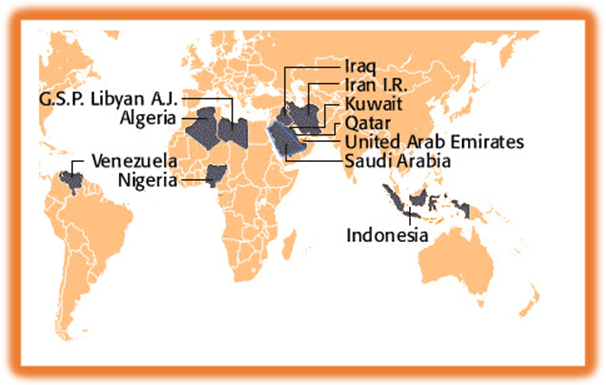 Most of these countries are members of the Organization of the Petroleum Exporting Countries (OPEC). While OPEC countries produce about 40% of the world’s oil, they hold 80% of proven global reserves, and 85% of these global reserves are in the Middle East. The oil wealth of OPEC countries allows them to be the strategic pivot of world politics and economy, but their record on human rights, political stability and compliance with international law is, unfortunately, not positive. It is important to have an understanding of the geopolitics of oil and gas when trying to comprehend current economic conditions surrounding these scarce resources. Western countries must bear in mind the fragility of political circumstances with the leading oil producing countries and make decisions that continue to decrease dependence on these unstable countries.